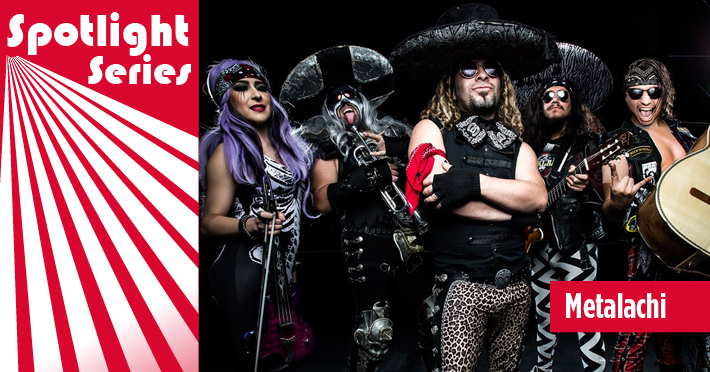 Tomorrow, Metalachi—the world’s first and only heavy metal mariachi band—brings their explosive fusion of mariachi and metal to the Levitt AMP Escondido stage! Clad in costumes as vibrant and eccentric as their music, Metalachi uses a blistering combination of modern and traditional mariachi instrumentation to play iconic rock and metal anthems like you’ve never heard. With bright trumpets, soaring violins and driving guitars, they create passionate original covers of songs by hair-raising musical icons like Black Sabbath, Guns N’ Roses and Slayer. Born in Juárez, Mexico, and raised in Los Angeles, the half-brothers who formed Metalachi in 2008 found the group’s bold sound by drawing from their family’s rich Mexican musical heritage, and the plethora of genres that surrounded them growing up in Los Angeles. The band’s unlikely take on classic metal hits celebrates the common ground between metal and mariachi, highlighting the passion, danceable rhythms and high-octane energy that characterize both genres. By intertwining two such energetic genres, it should come as no surprise that bandmembers told the BBC, “The way we feel when we perform…it’s out of this world.” The band feeds off audience members’ palpable energy, which amplifies their playful showmanship and dynamic live performances. Looking out at their audiences, Metalachi recognizes that they’re bringing together more than just musical genres. “The most important thing for me is to see people of different backgrounds come together,” lead singer, Vega De La Rocka remarked. “Once you close your mind to listening to one [genre], you stop growing…” The group’s commitment to blending such disparate genres serves as a reminder of what can be created with an open mind and the courage to push boundaries. This entry was posted in Spotlight Series and tagged Levitt AMP Escondio, Levitt Pavilion Los Angeles, Metalachi on October 19, 2018 by Nicole McGaffey.